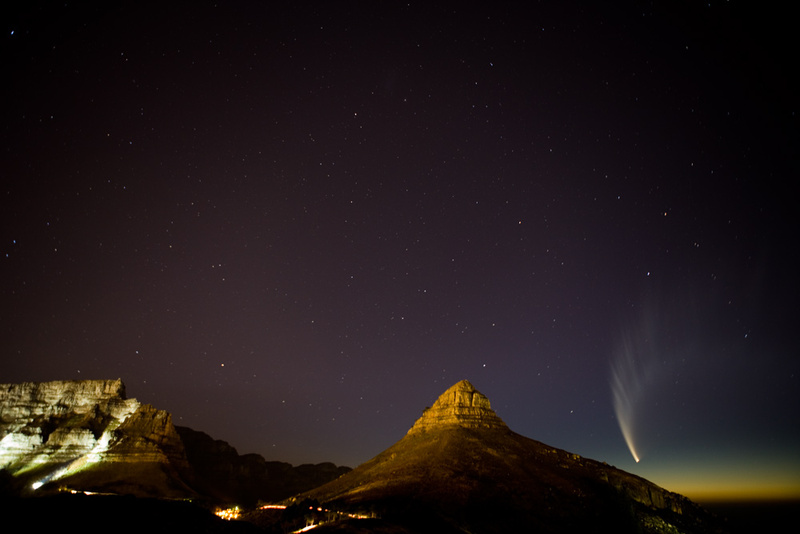 The cloud formation pointed it out to me! 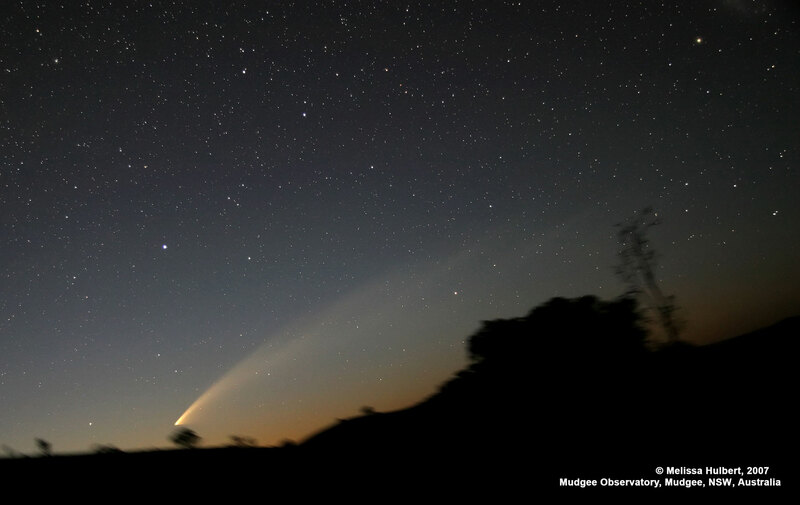 Comet McNaught was an obvious naked eye object with 15 degrees of tail visible this morning. Gale force winds were blowing at the edge of the cliff so I had to hold the tracking mount down to prevent it moving during exposures. 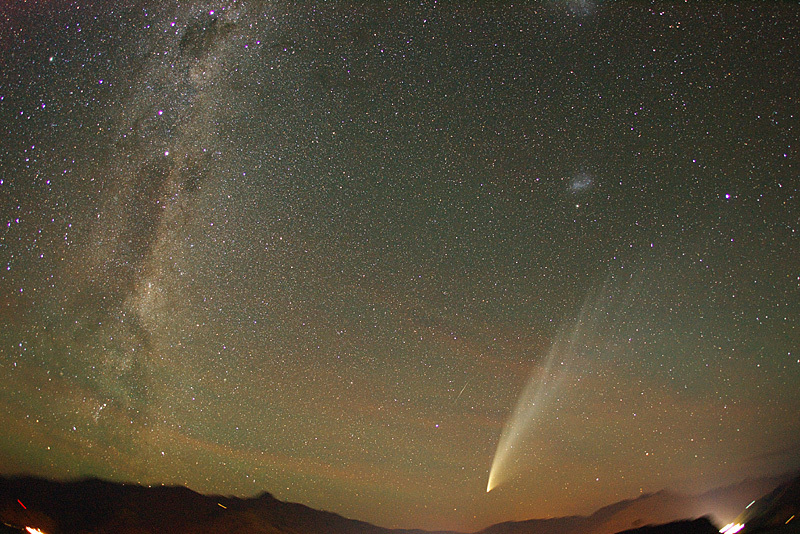 We can observe this comet at here lat. 45 degrees S all night long. 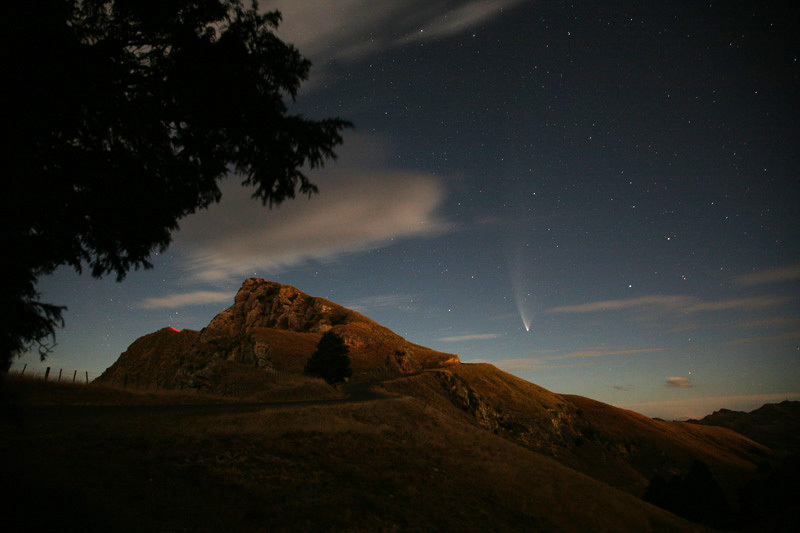 This comet has certainly got people interested in astronomy again. 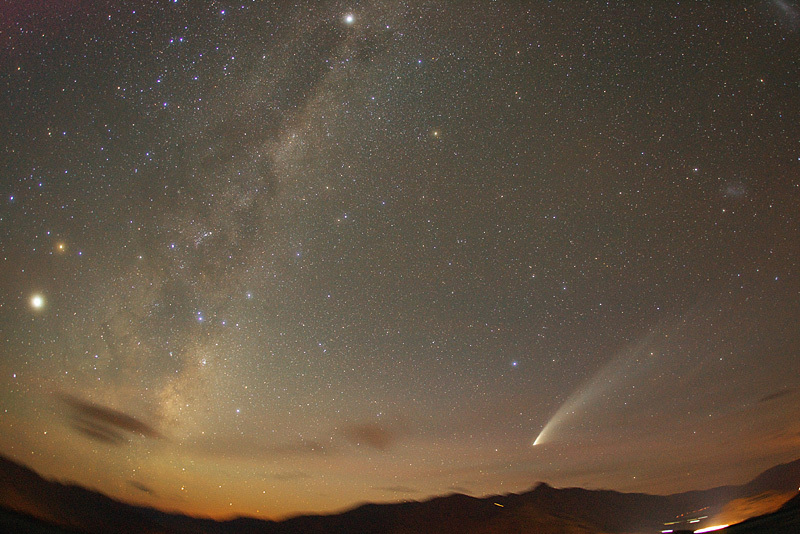 Good morning Comet McNaught! 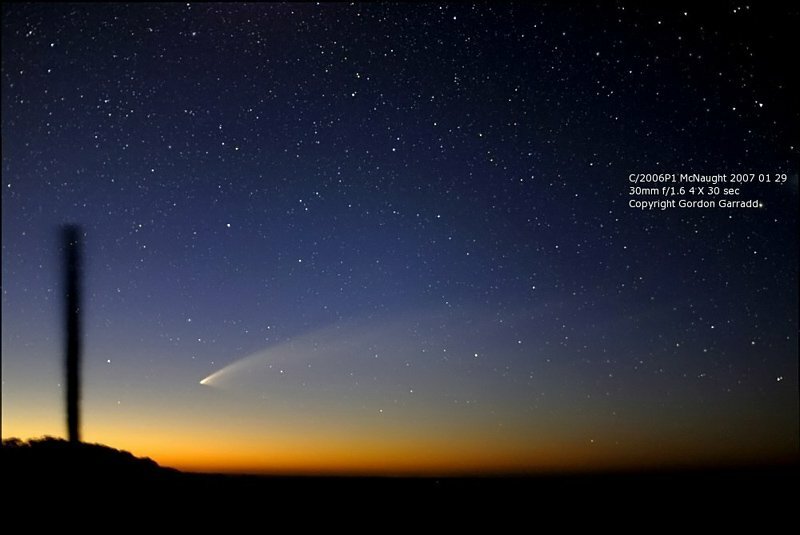 We were able to observe the tail for 2 hours before the head rose above the horizon. 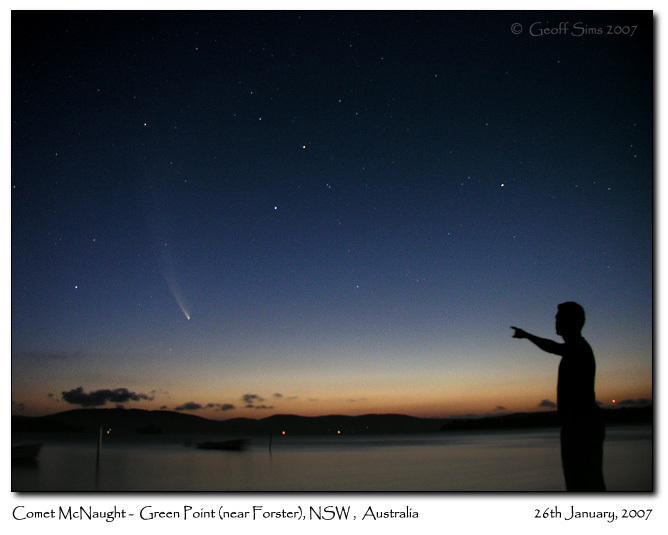 Here is Comet McNaught on Australia Day, setting over the lake near Forster, on the Mid-North Coast of NSW, Australia. 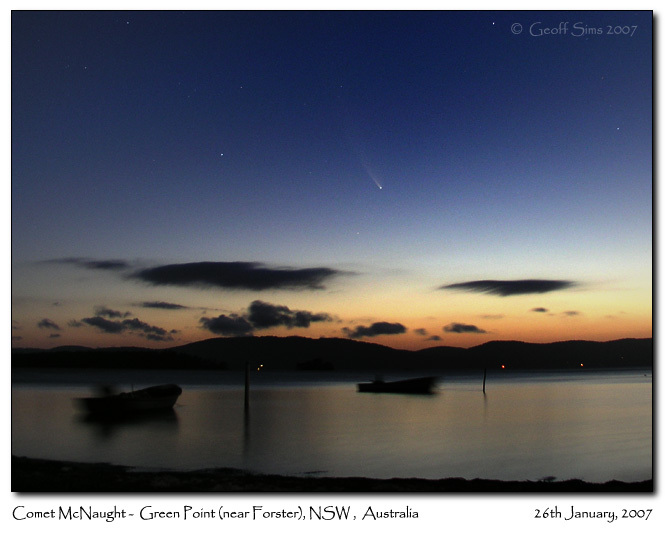 Even with a quarter Moon in the sky, the Comet was looking spectacular. 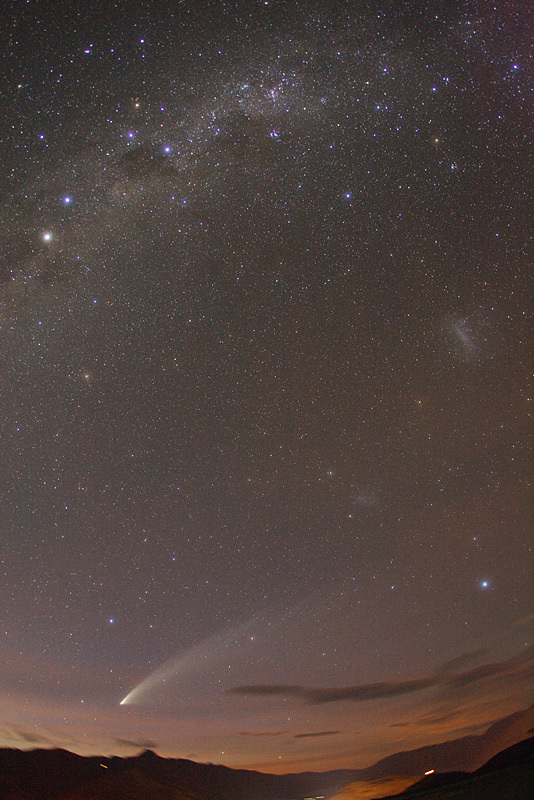 Photo details: Olympus C-5050, lens at 7.1mm, 16seconds at f/1.8, ISO 400. 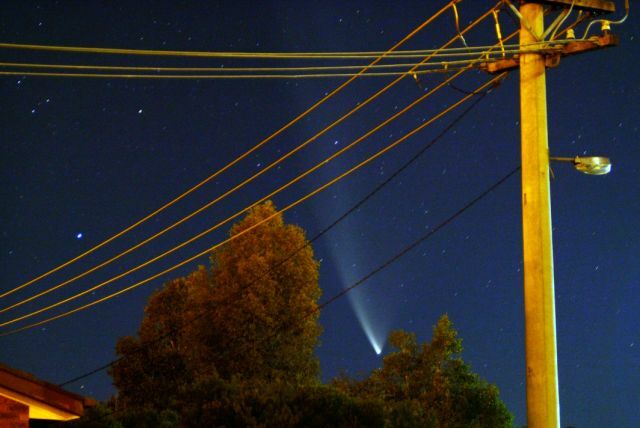 Fianlly got a clear night! Not as bright as it was but still a great show. 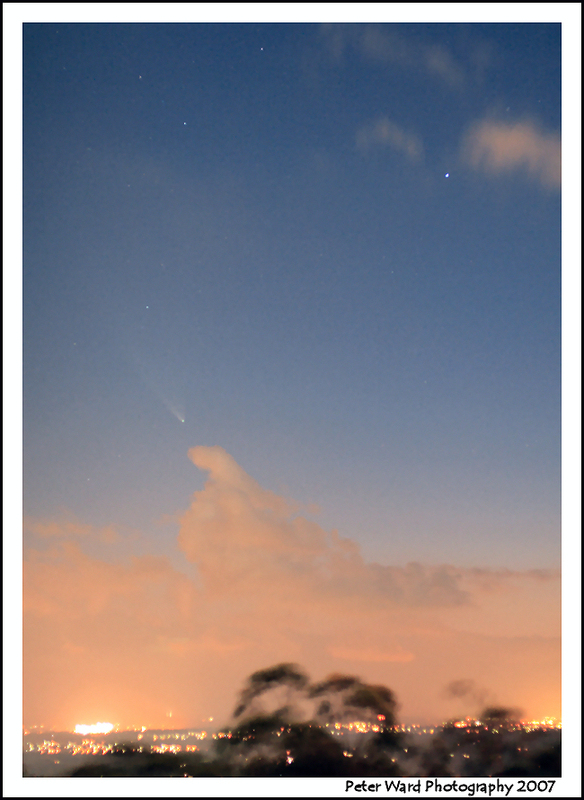 It was amazing to be able to watch the comet set and then less than 6 hours later watch it rise in the early morning sky. 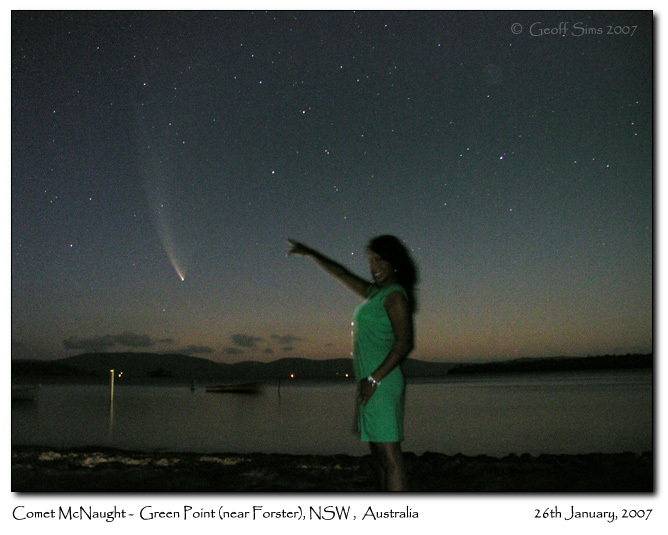 Comet McNaught still putting on a great show even under bright moonlight! 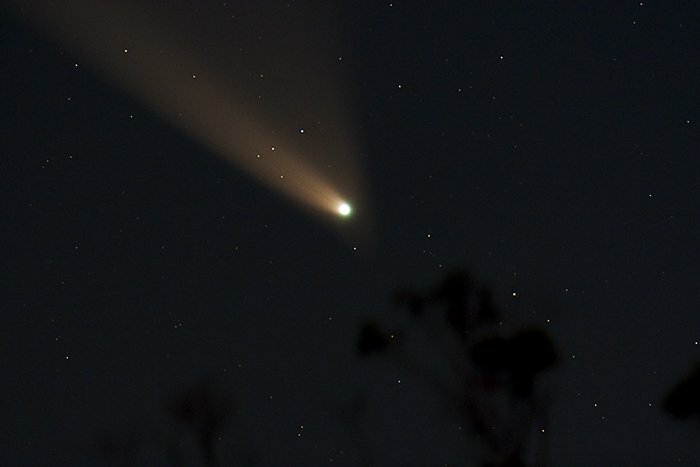 Photo details: Canon 20Da and 5" refractor, ISO 1600, 10 sec exp. 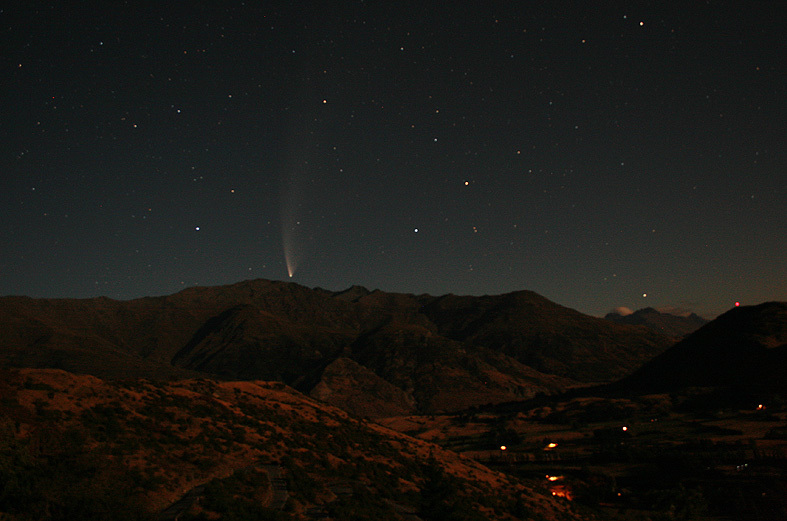 This is a shot of Comet McNaught taken from my back yard at about 9:30pm on the 26th January 2007. 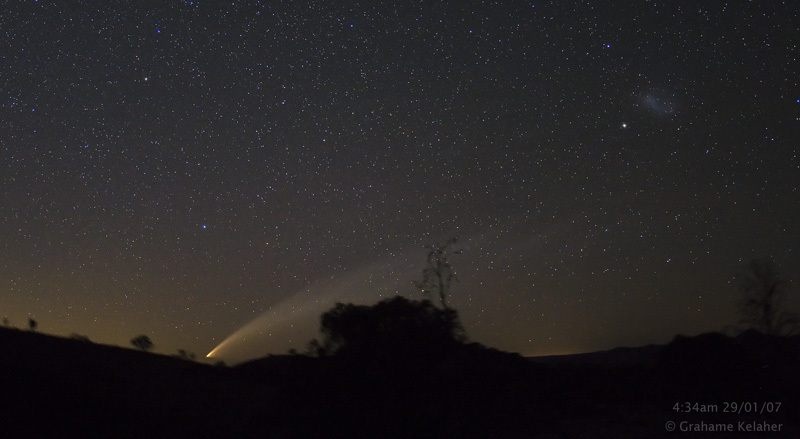 This is the first comet that I've seen this bright with the naked eye, very impressive! 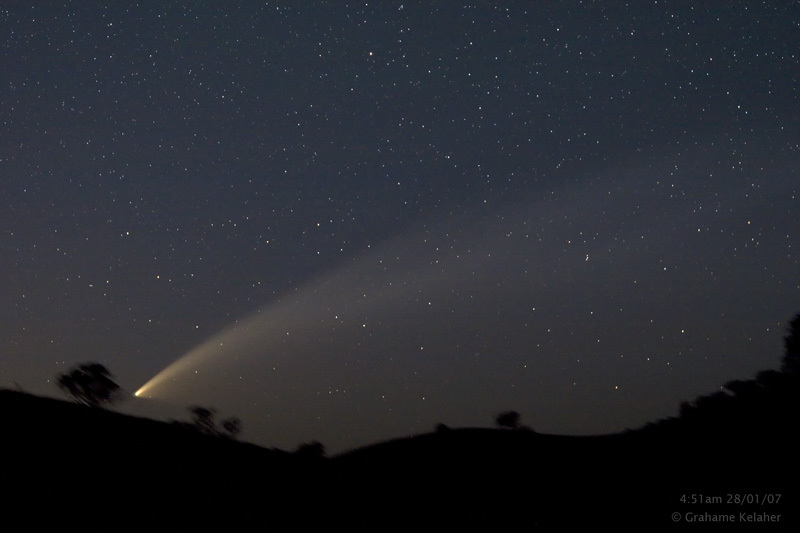 The best I have seen in my life--so bright you can nearly reach up and pick it out of the sky.